Republican leaders are at a crossroads on what their 2018 agenda will entail. Democrats have not signalled a willingness to comply on numerous issues. Congress faces a handful of legislative items before it can pivot to signature legislation like the recently enacted tax law. 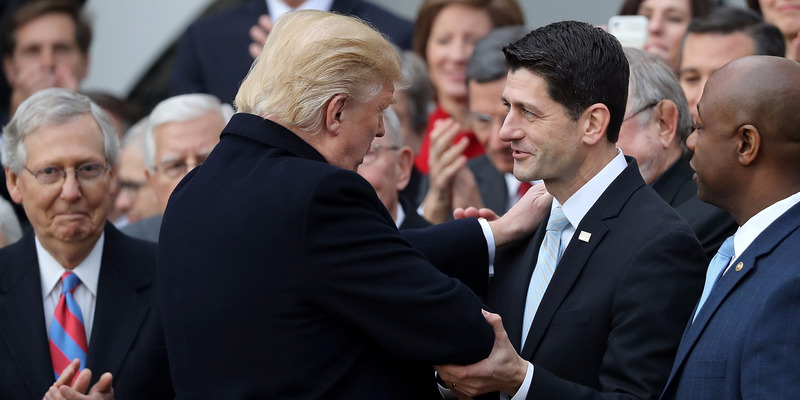 Republican leaders have significant differences on what the party’s policy agenda will entail for 2018 after securing a major legislative victory in overhauling the federal tax code with a law that included a blow to the Affordable Care Act. The Tax Cuts and Jobs Act, which President Donald Trump signed into law before heading to his Mar-a-Lago estate for the holidays, amounted to his first major legislative win since becoming president. The law was a team effort and a longtime dream of House Speaker Paul Ryan and Senate Majority Leader Mitch McConnell. Because the law includes much more than tax cuts – it removes Affordable Care Act’s so-called individual mandate and opens up Alaska’s Arctic National Wildlife Refuge for oil drilling – potential avenues for future agenda items are now viewed as increasingly possible for Republicans. Entitlement reform is another of Ryan’s elusive policy goals. With a massive tax law now under his belt, Ryan has hinted at wanting to go after entitlements like Social Security, Medicare, and welfare. “Next year, we’re going to have to get back to entitlement reform,” Ryan said in a radio interview early this month. And Ryan has allies in the House who agree that entitlements should be his next focus. Rep. Mike Kelly of Pennsylvania told Business Insider he hoped some kind of entitlement-spending control would be next. But Ryan’s desire to reduce entitlements is not shared by other Republican leaders. McConnell has said doing so is impossible without the support of Democrats, most of whom have already taken it off the table. “We will fight to defend them because they are about the health and economic security of America’s working families, and we will not use Medicare and Medicaid and Social Security as an ATM machine for the Republicans to give tax breaks to their wealthy friends and corporate America,” House Minority Leader Nancy Pelosi said at her year-end press conference, signalling that Democrats would not support cuts to Social Security and other entitlements. To make things more complicated, Trump has privately told multiple Republican lawmakers that he will not touch certain entitlements until he secures a second term in office. “I specifically recall the president saying that we weren’t gonna touch Medicare and Medicaid in his first term,” Rep. Kenny Marchant told Business Insider. The Trump administration will roll out an infrastructure plan in January, Marc Short, the White House director of legislative affairs, said Sunday on Fox News. While it is unclear how such a plan would be paid for, the plan is likely to cost upward of $US1 trillion. Rep. Bill Shuster, who chairs the House Transportation and Infrastructure Committee, met recently with Trump and White House officials about developing an infrastructure plan. “Addressing our nation’s infrastructure in a bipartisan manner is going to take strong presidential leadership, and I believe we have a president who can provide the necessary leadership and who wants to rebuild our infrastructure to strengthen our economy,” Shuster said in a statement. And unlike entitlements, some Democrats have hinted at a willingness to cooperate on infrastructure, making it a much more likely possibility for 2018. “As you consider the Administration’s proposal, I ask that you consider policies that will bridge the partisan divide and serve the myriad needs of communities across the country – including those of Nevada,” Sen. Catherine Cortez-Masto of Nevada wrote in a letter to Transportation Secretary Elaine Chao and Gary Cohn, the director of the National Economic Council. If a bipartisan effort is attainable, then McConnell could get on board with an infrastructure plan, as he noted at an event put on by the news website Axios earlier this month. When lawmakers return from their Christmas break on January 8, they will have to immediately address a handful of issues before any big agenda items can get underway. Republican leaders will hash out the 2018 agenda at a bicameral conference in West Virginia at the end of January. But right away, they will have to get started on a government-funding bill to prevent a shutdown after punting until January 19. Among other early obstacles for Congress are a legislative replacement for the Deferred Action for Childhood Arrivals program and the multiple healthcare-stabilisation bills promised by Senate leadership during the tax negotiations.